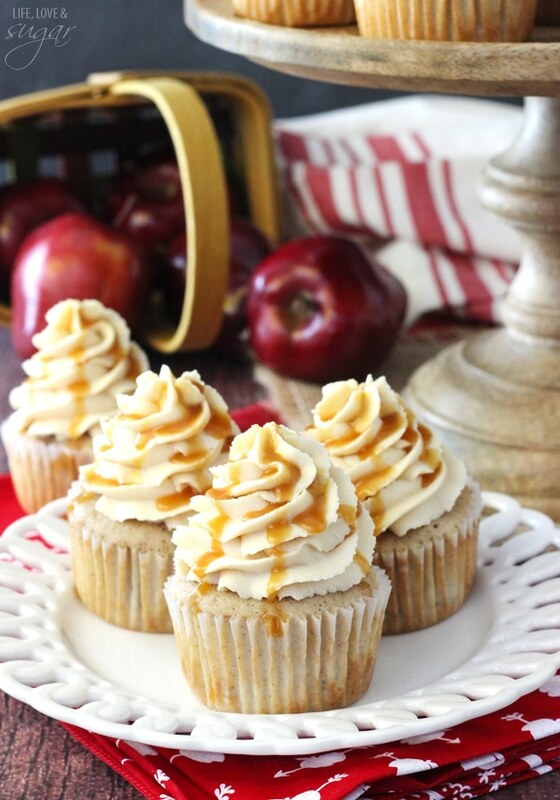 Caramel Apple Cupcakes made with a spiced apple cupcake & topped with caramel icing. 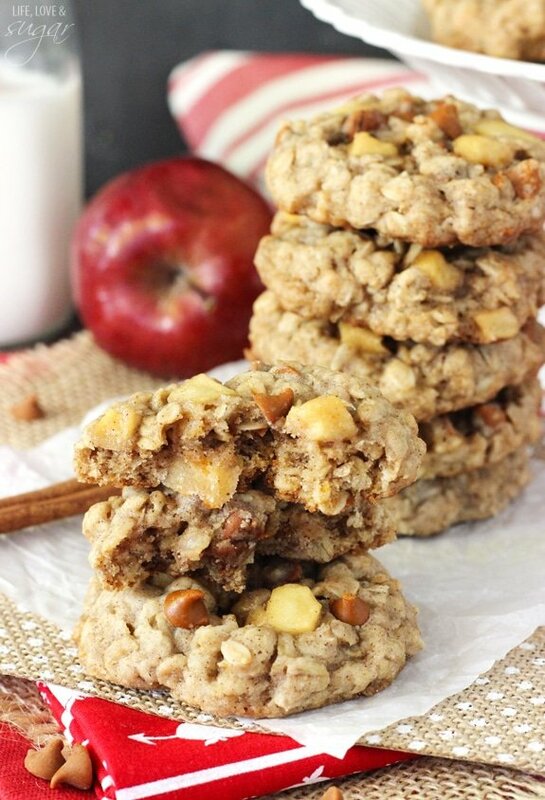 They melt in your mouth and are the perfect use for all those apples! So please tell me I’m not the only one that has those moments where you say something totally dumb without meaning to. The hubs gives me a hard time about it pretty regularly. Now it may seem like I was being kind of a smartie there, but I wasn’t. Something in my brain genuinely didn’t connect and I was like, I don’t know. Ha! Ohhhhhhh! Right! Yea, over there. Oops. ???? I had another one of those moments with a friend this weekend and felt like an idiot – again. Oh well. Let’s just call them my Jessica Simpson/Chicken of the Sea moments. They happen to all of us, right? Well these cupcakes should totally happen to all of us too. It’s only fair. When cupcakes are this good, they deserve to baked, shared and eaten by all! If I could, I’d hand you one right through the screen. 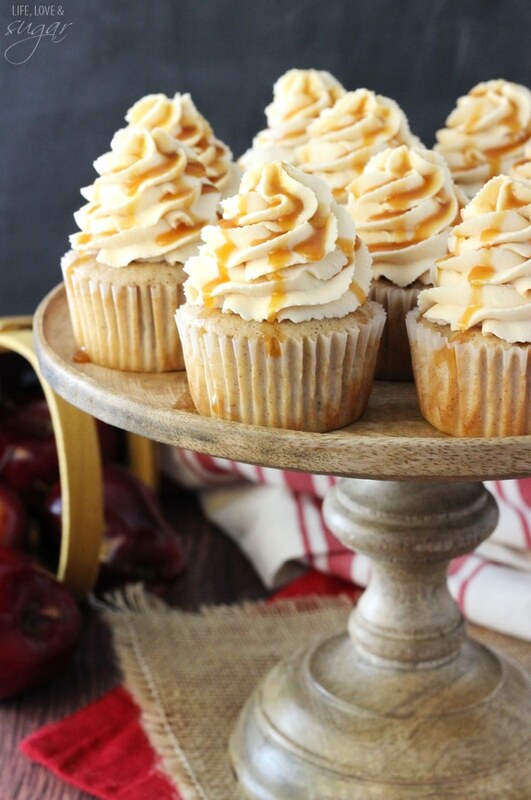 I totally love a good, moist cupcake and these are just that. Moist for days. Plus, only one bowl needed for a very simple mixing process. Do remember the caramel sauce I posted last week? And how I mentioned that you should go ahead and make it because you’d want it later? Well, it’s later. And these cupcakes are calling you. 2. 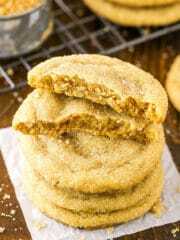 Whisk together flour, sugars, baking soda, baking powder, cinnamon and nutmeg in a large mixing bowl. 3. Add egg whites, vanilla extract, sour cream, milk and butter and mix on medium speed just until smooth. Do not over mix. 5. Fill cupcake liners about 3/4 full. 8. To make the buttercream, bombine butter and shortening and mix until smooth. 9. Add 4 cups of powdered sugar and mix until smooth. 10. Add caramel sauce and mix until smooth. 12. 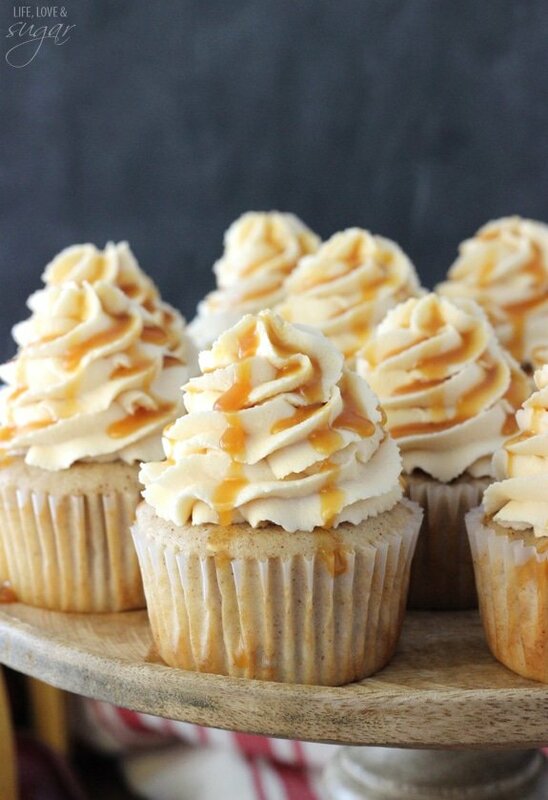 Top cupcakes with icing and a drizzle of caramel. I always say ridiculous things too! 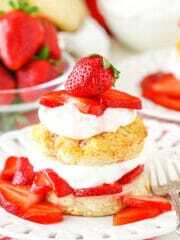 Look yummy! HA! I laughed out loud about Jessica Simpson. She will never live that down. Also cupcakes, need them, want them, must have them. Ah well at least, unlike Jessica, your blonde moment wasn’t caught on television! 😉 These cupcakes look marvelous Lindsay! Your pipping is perfection! Looks great! What kind of apple did you use for the batter, and did you use salted butter for the buttercream as well? Thanks! I believe I used red delicious apples, but any should be fine. And yes, I used salted butter in the buttercream too. Enjoy! 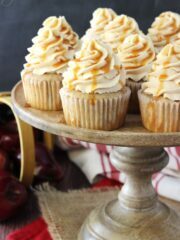 Caramel apple is one of my favorite fall combinations! These cupcakes look so good! Ha ha! This really made me laugh, because my husband is the absolute KING of dork mouth. And it just gets worse and worse once he starts, it’s like his brain explodes and he can’t stop. I sometimes have to declare a “No more talking!” Ah, love it. These look amazing! My best friend loves anything apple related – can’t wait to make these for her party this weekend! I hope they were a hit! Do you have to use shortening in the icing? Is there a substitute I could use? Thanks! You could replace it with additional butter. 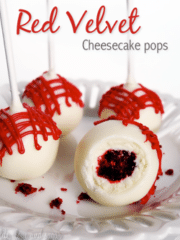 These looking amazing, I can’t wait to make them! Can I switch out the sour cream for something else? My husband can’t eat yogurt or sour cream. They should be fine if you use additional milk in place of the sour cream. Just curious? Do you peel the apple? 8 cups powdered sugar sound like an awful lot…..how many pounds is that? 2 two lb. bags? Yes, that’s correct. It would be a 2 lb bag. Four cups is one pound. I halved the frosting recipe and was able to pipe all my cupcakes and still had leftovers. We recently had a family reunion/picnic. I was in charge of desserts. I decided on taking all cupcakes. I baked almost 100 cupcakes (five different kinds). Top 2 favorites were these caramel apple pie and a lemon meringue cupcake. The apple was my favorite. Mine were a little messy but who cared. 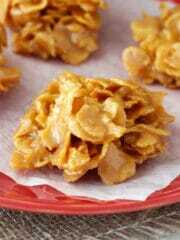 Made about 2 dz and they just disappeared in a couple of minutes. Kinda’ messy but oh so good. What can I use in place of shortening? I made these for work today and have just a couple comments. Recipe made 18 cupcakes only for me. If you use this caramel recipe watch it closely as it gets done more quickly than you think… mine was a touch overdone I think and had a few lumps, but worked fine yet thankfully. 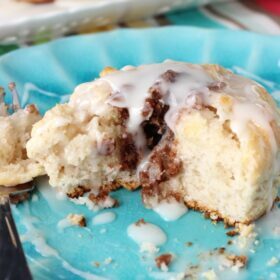 I have about 3.5 cups of frosting leftover and I was generous, frosting similar to those pictured here. They were very tasty, moist and I received a few compliments so far. Shouldn’t there be some sort of liquid in the frosting? Once everything was mixed, it was all crumbly. I ended up adding milk slowly to get an actual consistency. Great recipe otherwise, everyone loved them and i’ve had two people ask me for it! In this case, the caramel was my “liquid”. If it was too thick for you though, adding the milk is how I’d thin it out. 🙂 Glad you enjoyed the cupcakes! These look amazing, can’t wait to try them next week! Quick question.. if I wanted to make mini cupcakes, how should the temperature and cooking time be adjusted? And do you think it would double the yield? Thanks! I would probably leave the temp the same, but reduce baking time to 8-10 minutes. You’ll have to try it though. I would think it would at least double the yield. 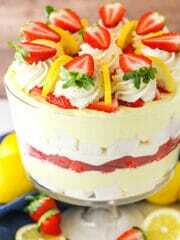 I love your cake plate! Where did you get it?! THIS WAS A DISGRACE TO THE CUPCAKE LORDS!! i threw up in my mouth and the flavor is still taunting me. 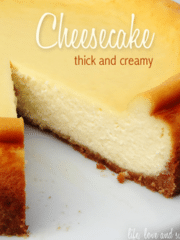 Trust me when I saw to NOT USE THIS RECIPE!! can I make them two days before? 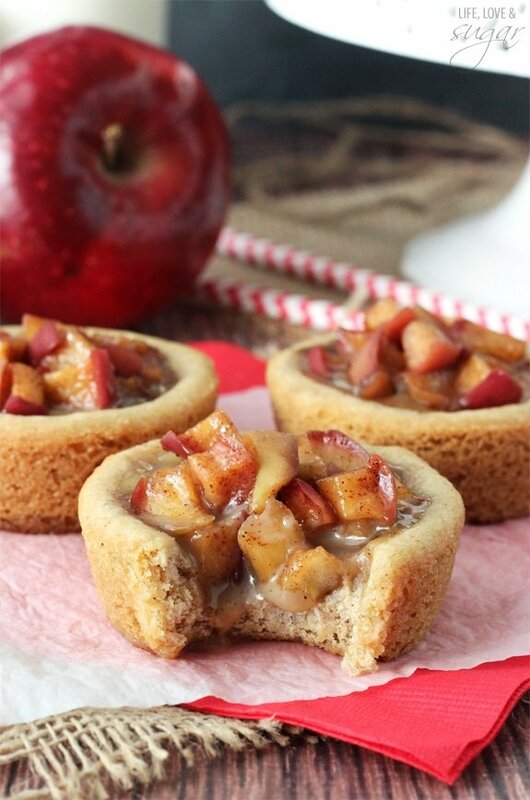 Wonder if the cooked apple will make them get soggy or go bad. I’ve made them once before they were amazing! Thanks! The cooked apples should be fine. Glad you’ve enjoyed them! 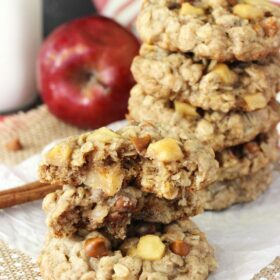 Is there a way to use apple sauce vs chopped apples? If so how much apple sauce would I substitute? I’m not sure exactly without trying it. You could try swapping out some of the milk for the applesauce. 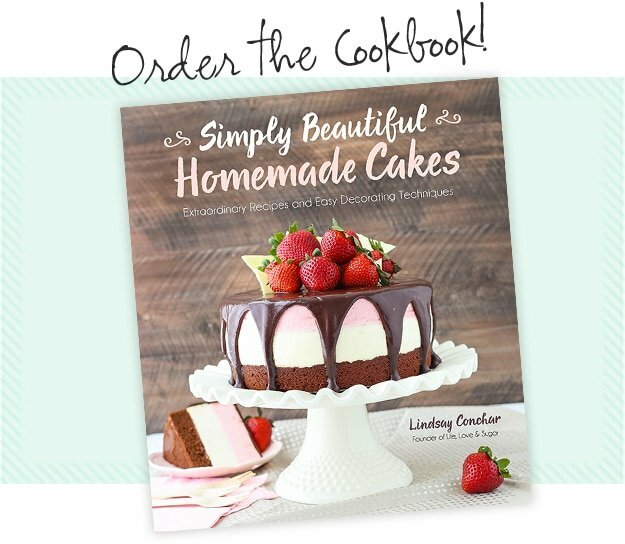 I was just wondering how many cupcakes does this recipe make? Can I use store bought caramel ice cream topping as the caramel sauce? You can, just keep in mind that it’ll be a thinner sauce (probably, depending on brand) and you might not need to add as much to the frosting or it’ll thin out too much. Also, if you have to add less caramel, you may not have as strong of a caramel flavor in the frosting. With the buttercream recipe you said 8 cups of powder sugar but with the directions you on say to add 4 cups. Do you need 8 cups. In step 9 you add 4 cups, and in step 11 you add the remaining. It’s 8 cups total. I made these last week, but eliminated the nutmeg because I don’t like it. Seriously, the best cupcake ever!!! I had leftover icing which I froze. I’d like to turn this recipe into a cake to use the rest of the icing. Do you think it will turn out ok as a cake? I’m glad you enjoyed the recipe! Yes, it can be turned into a cake, but keep in mind that it is fairly dense. 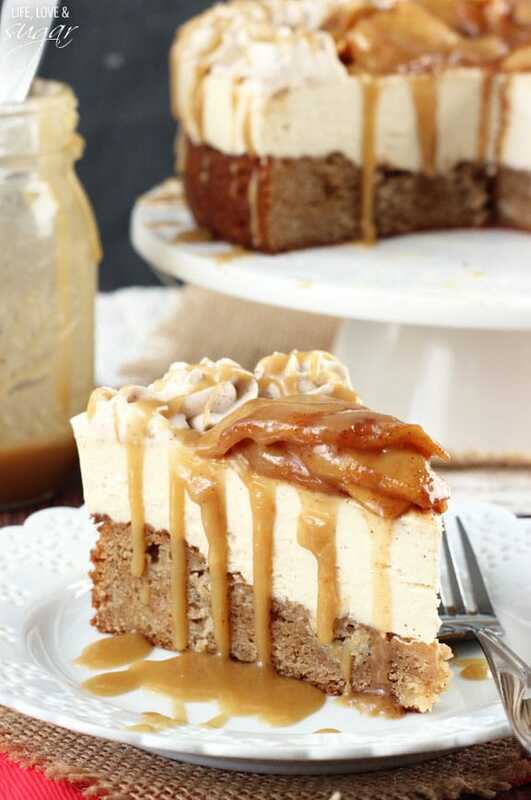 Check out my recipe for Caramel Apple Pecan Layer Cake. 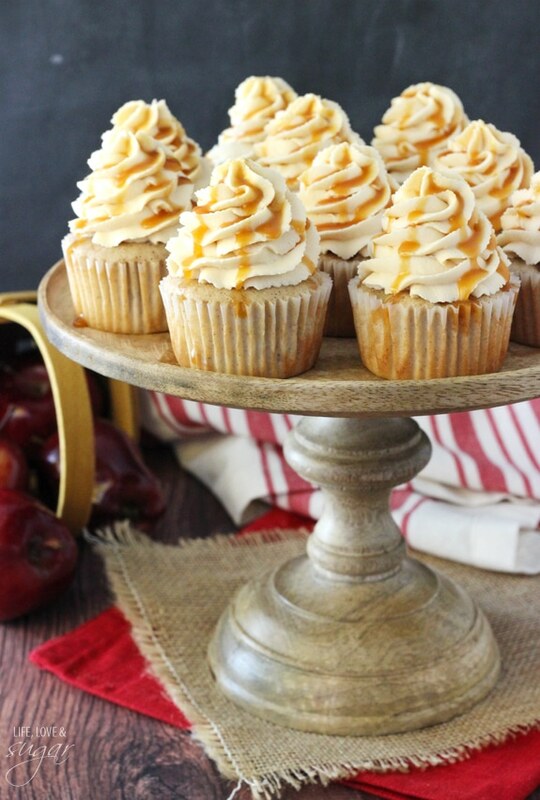 This is very similar to the Caramel Apple Cupcakes, just leave out the pecans. 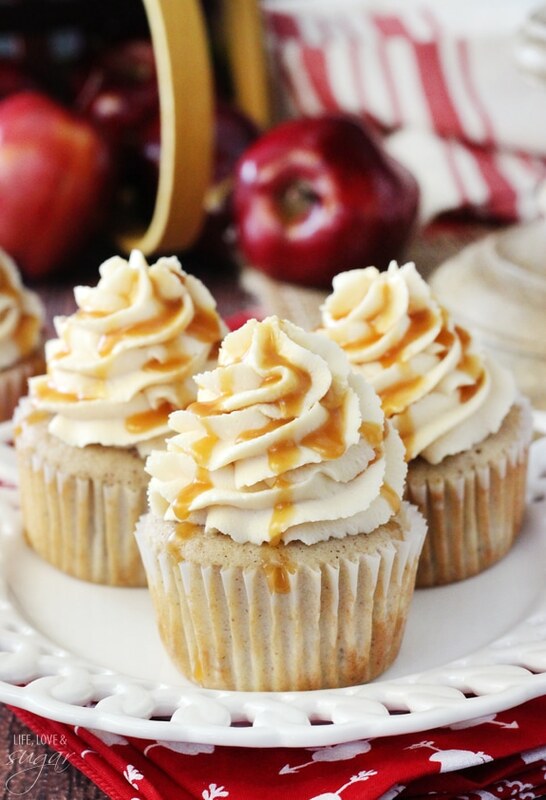 Are the apples inside the cupcake Supposed to be like eating a hard apple vs. poked apple (apple pie)? The apples should soften when baking. If they didn’t, try chopping them a little smaller. You could also cook the apples prior to adding if you wanted them to be really soft. I have made these cupcakes for a silent auction before, and they were a BIG hit. I don’t have anything to criticize on these, and they were moist, sweet, apple-y, and just downright delicious. When I made these for the silent auction, I added a cinnamon-apple filling, and the extra one that I did get to try was like taking a bite out of heaven. 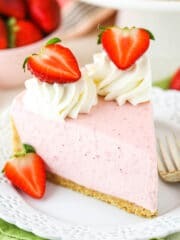 Today, I’m actually going to make these as a cake, with the apple filling I used last time as a filling in between the layers, and enter it in the local Texas Austin County Fair. 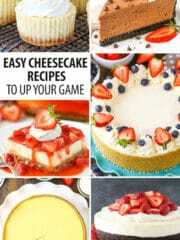 I’d like to know if you have a recommended time to bake the cake layers for, and any tips and pointers that could possibly help me. Also, would the cake fair well if it was left out at room temperature for several hours-overnight? I’m so glad you enjoyed them! 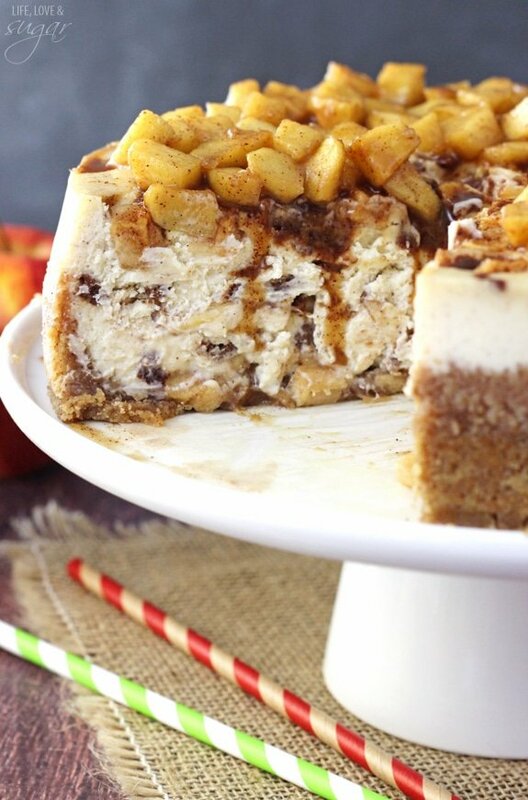 I actually just posted a Cinnamon Apple Cake today that might be a good one to reference. These cupcakes as a cake will be quite dense, if I remember correctly. 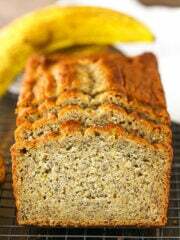 The new recipe I posted will be a little lighter. It also has a wonderful apple filling (which is very caramel-y), if you’re interested in trying that one. 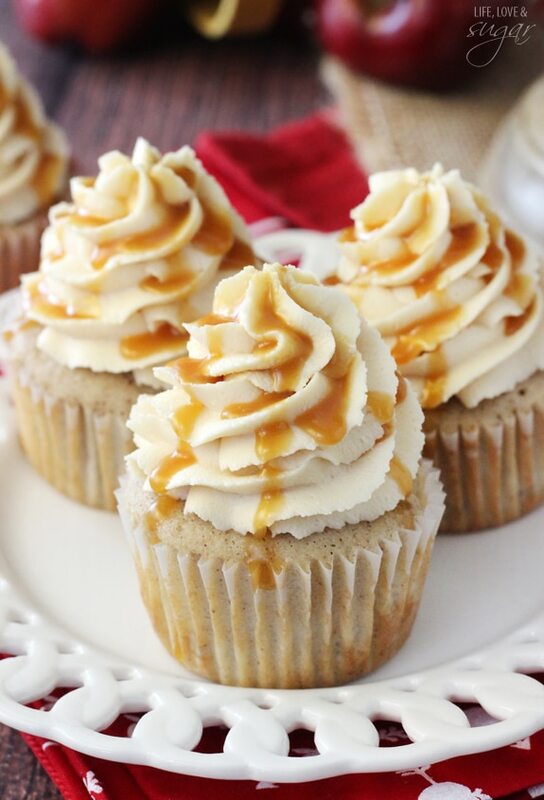 You could still use the caramel frosting from the cupcakes, if you wanted. I’d just double it or so, depending on how much frosting you like to use. Is it salted butter in the butter cream or unsalted?